Ii am Kimihiko ootsuru born [ as an ambassador / same ] in 1952. You made a speech in 17th Nippon Kisha Club of this month, and is touched by the threat of diffusion of mass-destruction weapons. I think that it is wonderful recognition. I think that the method of removing this threat is that it is required for a country with a nuclear weapon like your country to discard the core on its own initiative. It is carried out a nonviolent blockade action for the nuclear arsenal of your country named "Aldermaston Big Blockade" on October 27. This is a thing to demand the extinction of the nuclear weapon of the your country against a plan of the nuclear weapon update that Former Prime Minister Blair decided. I think that I am fortunate if I can have your support for this action. I sent the following emails to the Diet member of all your country to object to update of trident missile in March, 2007. I introduce it from some exchanges. I was moved that Mr.Fabian Hamilton mentioned that" one of my reasons was you and your fellow countrymen and women ".very much. I hasten to inform you. I am a Japanese citizen kimihiko ootsuru. Please stop the renewal of a trident nuclear missile. We Japanese are wishing it. In the world, we Japanese only know the disaster of an atomic bomb. My wife's mother is exposed to radiation in Nagasaki, too. bomb is done through necessity though now is made energetic. We many of Japanese are the relatives and have such a person to be near. There is only "Nuclear abolition" as saying also of Nobel Prize in Physics winner's Dr. Hideki Yukawa the only method of settlement of the problem of the nucleus frequently during one's life. Being able to control a nuclear war by the nucleus is an idea in a barbarous old age. We Japanese permanently abandoned the maintenance of the war and the war potential by making Article 9 of the constitution. The hand of an own, own government was voluntarily bound. You also want you to obtain the honor that becomes the first nuclear power that leaves for the viewpoint of wisdom that this human race reached at last and steps forward to the abolition of the nuclear weapon first. Please abandon the renewal of a trident nuclear missile. Thank you for your email. I am very sorry about the continued impact of the atomic bombs in Japan. The vote in the UK parliament was yesterday. I voted against renewal of the Trident system. Please see my website (link below) for further information. It is Kimihiko Tsuru of Japan which sent an E-mail of a request to object to for updating a Trident nuclear missile submarine. I am very pleased that you objected to this vote . I am moved that you mentioned that" one of my reasons was you and your fellow countrymen and women ". If the Japanese pepple and the British people raise a voice, a British nuclear weapon will be disposed of by all means. And it will be to clear a way for extinction of a nuclear weapon of the whole world. I pray for your future activity. thank you for your very touching email. I am delighted to tell you that I voted against renewing the Trident nuclear missile submarine on Wednesday in our Parliament, and one of my reasons was you and your fellow countrymen and women. You are the only nation on earth to have known the suffering caused by these terrible weapons and so you have the right to tell us not to make any more. We must listen to your terrible experience and act accordingly. Thank you for your views. 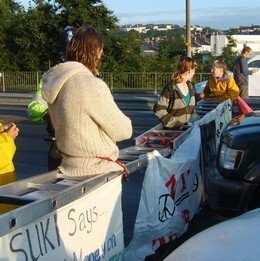 A blockade of a Japanese team in faslane base is schedule on 25-26 days in July. Thank you for reading the whole sentence.